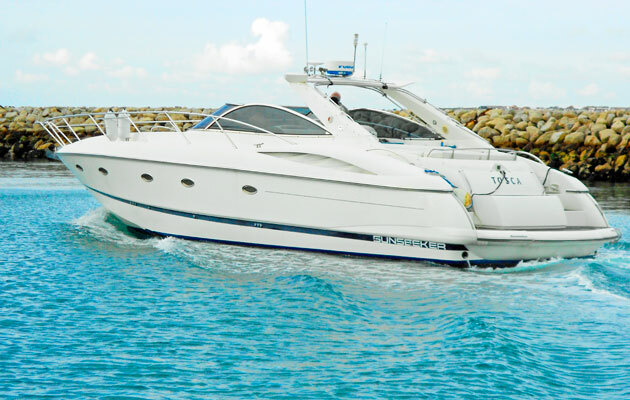 Most owners of fast cruising motor boats don’t actually spend that much time under way, burning up expensive diesel. But to be able to use spells of quiet weather to get across the Channel and reach interesting new places quickly is a real plus, especially for family holidays. I also think it’s important for newcomers to fast cruising to appreciate that you don’t need a large boat to travel to interesting foreign places, as this next example shows. My favourite Brittany marina at Plouër- sur-Rance is not far upstream from St Malo, a peaceful rural haven in an old mill pool. This is our snug winter base, whose calm rural atmosphere is enlivened by the fascinating cruising folk who keep boats here. One of our neighbours, François Unger, is an experienced seaman who once managed all the docks’ engineering at Le Havre. He is also a great Anglophile and we rarely pass his boat without popping aboard for a morning coffee or an evening glass of wine or rum from his excellent, inexhaustible cellar. His boat Cofare is an unassuming Bénéteau Antares 12, one of my favourite French fast cruising designs for its seaworthy hull and practical deck layout. Cofare has two 370hp Volvo D6 diesels and is fully equipped for offshore passages. François recently cruised to Copenhagen via the Dutch coast, Kiel Canal and the Baltic. Two seasons ago he went up to the Firth of Clyde, crossing to Plymouth via Guernsey, around Land’s End to Padstow and Milford Haven, then on past the Irish coast and Isle of Man (pictured below). Last summer Cofare hopped around the Bay of Biscay to the stunning Basque coast of Spain, exploring as far west as Santander. Although quite a modest size by current standards, the Antares 12 is a proper fast cruising boat – able to eat up the miles at 20-22 knots in quiet weather, but copes well in brisk conditions if the weather doesn’t play ball. François is a meticulous planner and his passage legs are carefully researched before he leaves Plouër. To me, his quietly ambitious style is an encouragement for all kinds of boats to venture further in manageable stages. François thoroughly enjoys cruising abroad and that unique satisfaction of independent travel by boat: “Each port-of-call is a discovery, of course nobody speaks French! Favourite harbours: Falmouth in England and Peel on the Isle of Man, while in Ireland it’s Greystones and Howth near Dublin. Scotland’s gem is East Loch Tarbert. Nick Moger bought Tosca Blue last April in Cannes and trucked her back to Portland Marina, which is handy for where he and his wife live near Yeovil. Nick always has Fridays free, when he invariably drives down to the boat. Sometimes he just potters on board, but often he’ll go out for a spin around those magnificent sheltered reaches east of Portland (pictured below). Last summer Tosca’s cruising was mostly local, along the coast to Lulworth Cove or Worbarrow Bay, and into the Solent where Haslar Marina is a favourite, with good berthing for a 50ft boat. “Some Fridays, a friend and I just go to Weymouth for lunch. The diesel costs rather more than the lunch,” he admits. 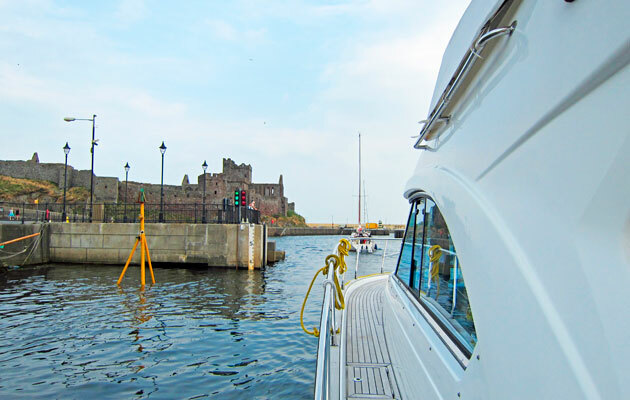 Nick is planning an early season cross-Channel jaunt to Cherbourg, a convenient 63 miles from Portland Marina. The Camargue’s two 669hp Caterpillars give a comfortable 26-knot fast cruising speed with a maximum of 35 knots, so Cherbourg is barely 2 1⁄2 hours in quiet conditions. Later in the summer, Nick and his wife will head down to St Helier in Jersey, a favourite destination less than 4hrs from Portland. Sometime in the summer Tosca will be off down to Cornwall and the timeless River Fal. Nick and his wife have spent many idyllic family holidays at Porthscatho, a picturesque Cornish village facing Gerran’s Bay with a splendid anchorage sheltered from the west. Nick is extremely happy with his boat, and with Portland Marina as a “very friendly, well placed base”. He’s looking forward to many years of relaxed cruising.